I Just Inherited A Fort Worth TX House Now What? Call Tim! First, we’re so sorry for your loss. This can be a very challenging and stressful time for many reasons, and dealing with an inherited property you don’t want is tough at the best of times. We can Help! I Just Inherited A House Now What Do I Do…. Selling Your Inherited House is Not Scary… Honest!!!! Selling Your Inherited House is not supposed to be scary…..
We understand how hard it is to deal with inherited property, let us help you now. We can buy quickly and eliminate your need to pay any out-of-pocket expenses to sell your home in probate and we will buy it as-is so you do not have to clean it out or do any repairs. Our goal is to structure an offer that is a “Win, Win” for both the buyer and seller. We never use high-pressure tactics to get you to sell us your house and we will show you the information and figures we use to calculate a fair offer for your property. Call our free Recorded Info-Line at (817) 550-5069 Ext# 5008 to learn more! Are you’re thinking, “I just inherited a house now what do I do with this unwanted house?” Should I rent it? Should I sell it? How should I sell it? Decisions decisions….. If you have inherited a home you don’t want, we can help. 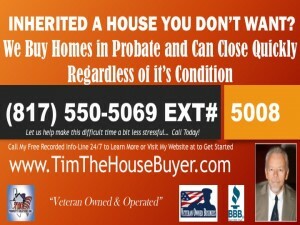 We buy unwanted houses and homes in probate. … TMC Property Solutions can help. We’re local real estate investors in Fort Worth Texas, and we’re looking to buy several houses each month in the Fort Worth and the surrounding area. Every month we get calls from families who have inherited a house and are looking to sell their house fast… so included below are some tips to help you navigate the process. I Just Inherited A House Now What Do I Do Next? This may sound obvious, but if the person who left you a property also had a mortgage (unless it had no mortgage and was paid off, which is great! ), you have to pay it (assuming you want to keep the property). Some banks will allow you to assume the loan, while others may force you to refinance into a new loan in your name. If you don’t qualify for a new loan due to credit issues or you do not have the funds to pay for closing, renting may not be an option for you. If dealing with brokers, maintenance, tenants, rent collection and all the nuances of property management isn’t the best use of your time, hire a professional property manager to help you or sell the house now cash out. Some people who inherit homes decide to keep the house and rent it for extra income. That’s a great strategy for sure if you have the time and personality to deal with tenants. You just need to be prepared to manage the property and the hassles that can go along with tenants and toilets. It’s rare to see a house that’s been perfectly maintained, especially if it’s more than a couple years old. Most inherited houses need major improvements which means you need to have the funds or be able to borrow them from a bank, family or friend. Consider hiring a professional property/home inspector to give you a detailed rundown on what you’ll need to do within the next five years, along with estimated costs. Surprises can be very, very expensive and frustrating. If you don’t want to deal with making repairs, updating kitchens and bathrooms, replacing an old roof, improving landscaping and overall cleanup, etc., don’t worry. We Buy Houses Fast in Fort Worth for cash, as-is, we can close quickly, and you never pay closing costs or commissions when you sell to us. 5) If the market will continue to grow faster than your other options, hang on to the home as an investment property. Don’t forget to discuss your inheritance with tax and legal professionals before you take action. There are major property and income tax consequences that will dramatically impact the cost of owning your investment property. In certain situations we may be able to help you structure a rent-to-own agreement that allows you to rent and sell at the same time – capturing the best of both worlds or, possibly an owner finance sale is another great option when done correctly. These kinds of deals can be complicated, but our Dallas Fort Worth investment experience can help you win win solution. NOTE: To learn more about tax and estate planning related to inheriting a house please read more here. Please watch the below video to learn more when you need to sell an inherited house you don’t want. Just call our free recorded info-line at (817) 550-5069 Opt# 5 or contact us now for more information on how we can make you a fair all-cash offer on your inherited house! Sell Your House Fast In Fort Worth or the surrounding area TODAY!